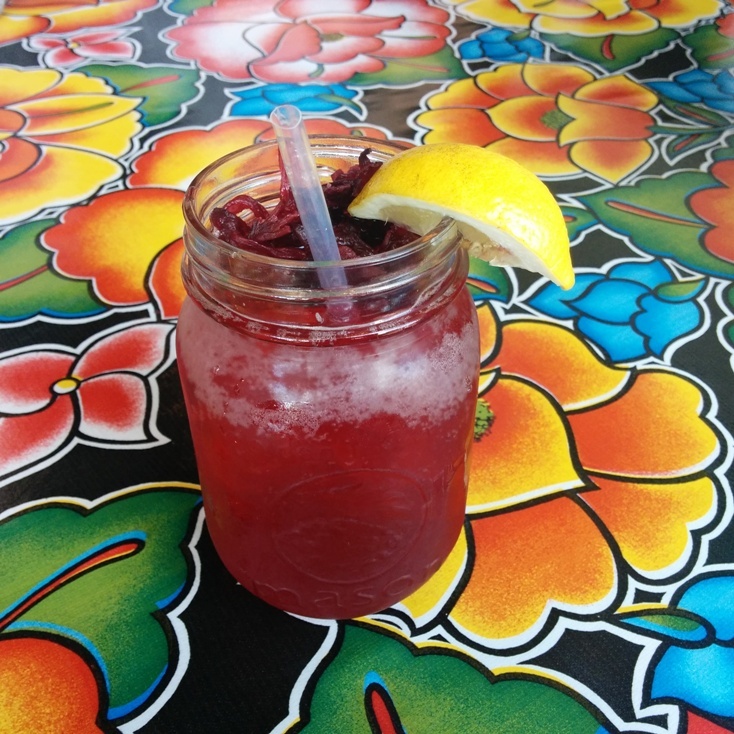 This was the Hibiscus Lemonade made with tequila and I’m not sure what else but it was very yummy! Perfect drink for a summer day! 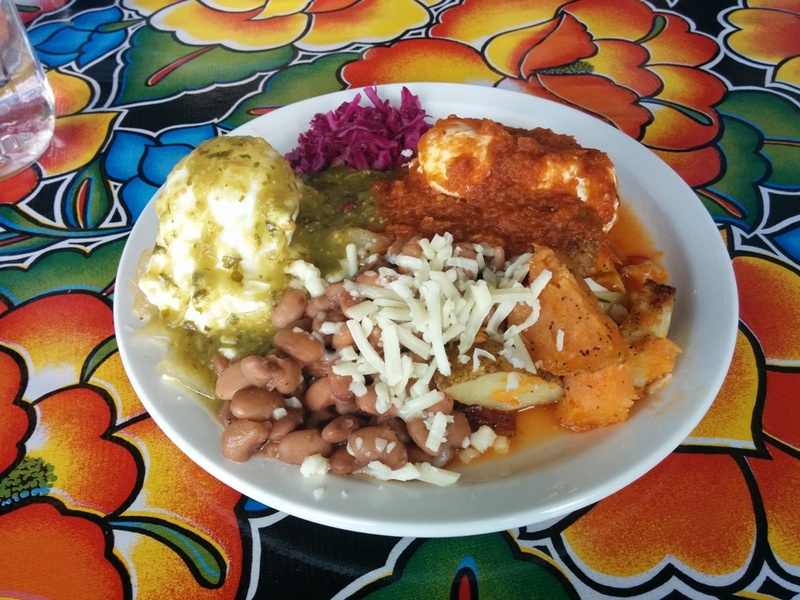 If you’re ordering the Enchiladas, you get to choose your filling (black beans, roasted butternut squash, or chipotle tofu), the sauce (Mole, Enchilada or Salsa Verde) and the side (rice and beans or salad) you want. 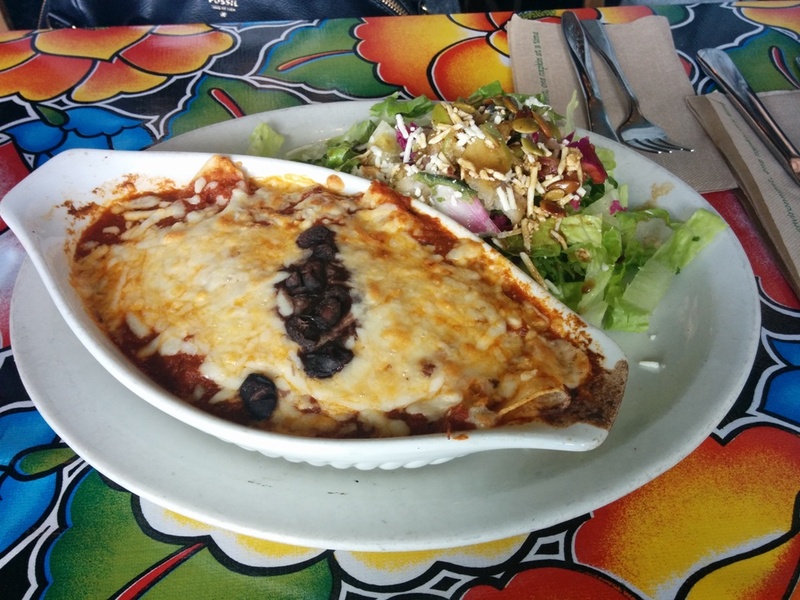 This was the Rocky’s Enchilada with 3 corn tortillas stuffed with cheese and black bean filling, Enchilada Sauce and a side of salad. There was a lot of cheese and plenty of filling if you like beans! 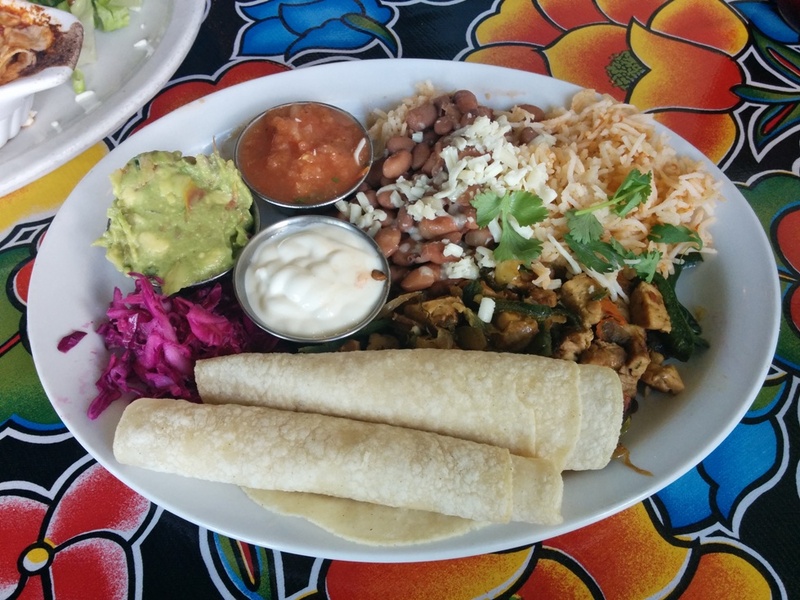 The Fajitas come with some corn tortilla wraps, beans, rice, tofu, sour cream and salsa. Guacamole was also added for $1.50. This is basically a fun DIY meal where you get to wrap up your own tortilla! For myself, I was feeling like brunch food (brunch is always a good idea)! Brunch is served 9am-3pm daily. This was the Sherman’s Benny with soft goat cheese and carmelized onions. There was also a side of beans and sweet potato. I chose to have the salsa verde on one benny and the regular salsa on the other benny. Instead of an English muffin, there was cornbread which I liked except it does get a bit soggy after a while. I liked the benny but I am not a fan of beans in general and the sweet potato was okay but I wasn’t really a fan either. Neither side had much flavour? Well ok, it tasted “natural” as in there wasn’t much additional seasoning. I don’t think I tasted any goat cheese in my benny either. I think generally the food was on the soft and mushy side, I would have appreciated more variety in texture. I understand that beans are common with vegetarian food and Mexican food but it’s really not my thing. The flavours were interesting but I wasn’t really lovin’ it so I don’t feel like I would return. 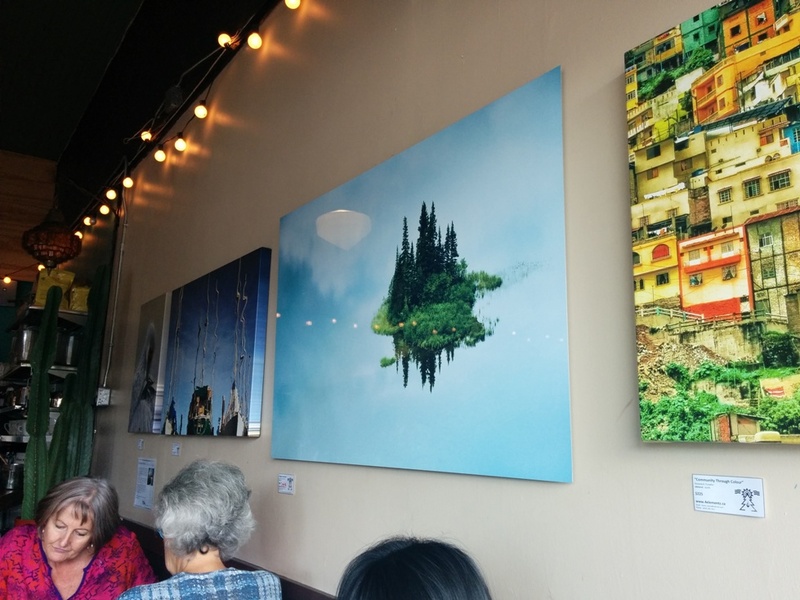 With that being said, I still feel like you should give this place a go if you enjoy vegetarian food because the atmosphere is cool and the pricing is good. Also that Hibiscus Lemonade was very memorable!! !